It’s been a little while since I looked at AllJoyn and the AllSeen Alliance. Both projects will collaborate to support future versions of the OCF specification in a single IoTivity implementation that combines the best of both technologies into a unified solution. Current devices running on either AllJoyn or IoTivity solutions will be interoperable and backward-compatible. Companies already developing IoT solutions based on either technology can proceed with the confidence that their products will be compatible with the unified IoT standard that the industry has been asking for. and so I guess that any use of AllJoyn at this point has to be seen against that backdrop. 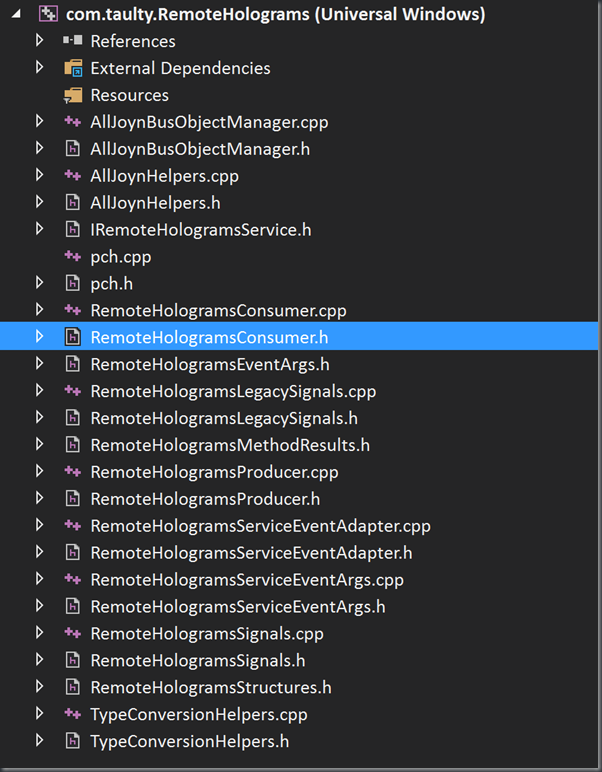 With that said, I still have AllJoyn APIs in Windows 10 and I wanted to see whether I could use those as a basis for the sharing of Holograms across devices. 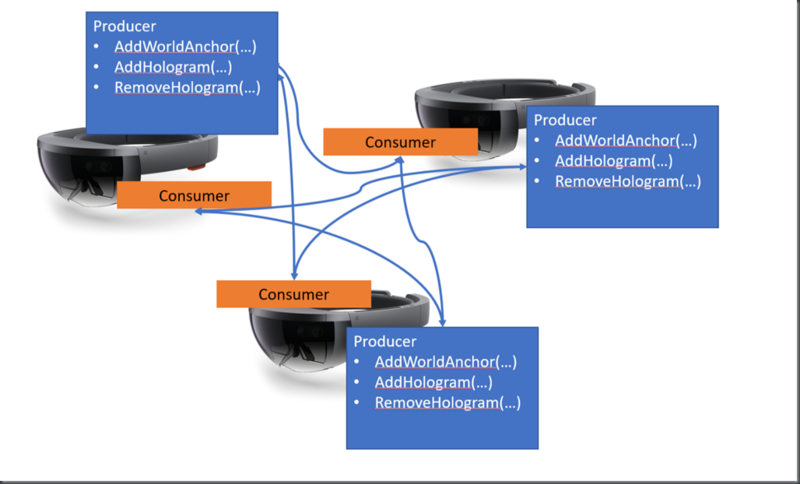 The idea would be that a HoloLens app becomes both an AllJoyn consumer and producer and so each device on a network could find all the other devices and then share data such that a common co-ordinate system could be established via world anchors and hologram creation/removal and positioning could also be shared. 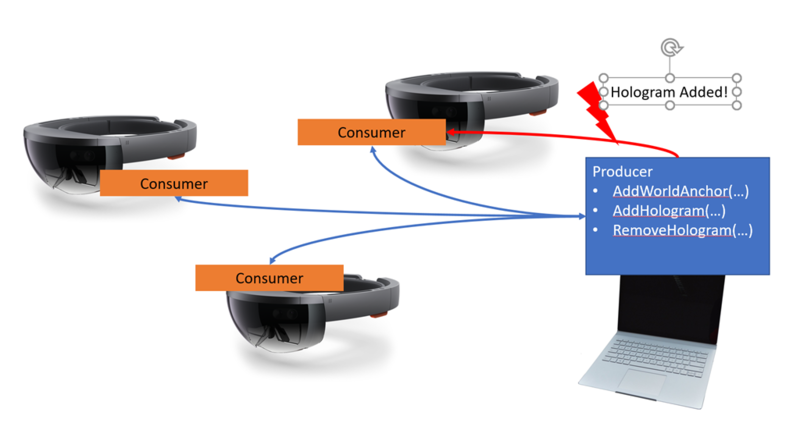 Now, I don’t think that I’d tried this previously but there was something nagging at the back of my mind about the AllJoyn APIs not being something that I could use in the way that I wanted to on HoloLens and I should really have taken heed. I figured that the “Hello World” here might involve a HoloLens app offering an interface whereby a remote caller could create some object (e.g. a cube) at a particular location in world space. 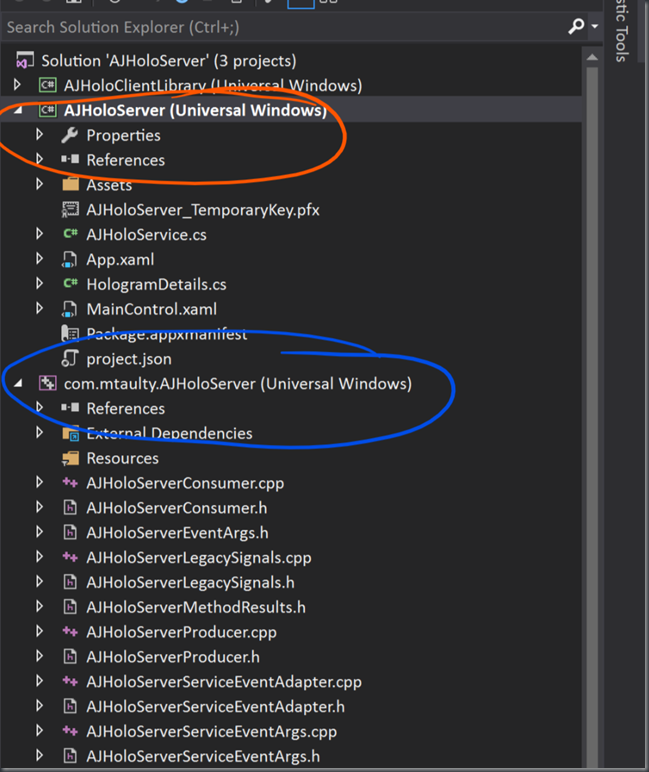 I then struggled a little with respect to knowing where to go next in that the tool alljoyncodegen.exe which I used to use to generate UWP code from an AllJoyn interface seemed to have disappeared from the SDKs. 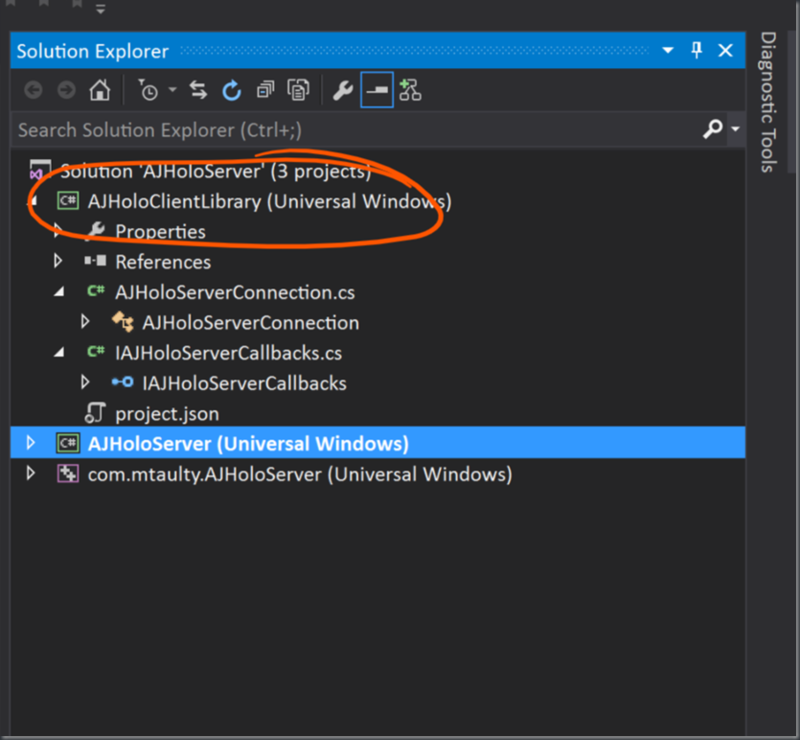 I gave up on the command line tool and went off to try and find AllJoyn Studio which does seem to still exist but only for Visual Studio 2015 which was ‘kind of ok’ because I still have VS2015 on my system alongside VS2017. Whether all these changes are because of the AllJoyn/IoTivity merging, I’ve no idea but it certainly foxed me for a little while. 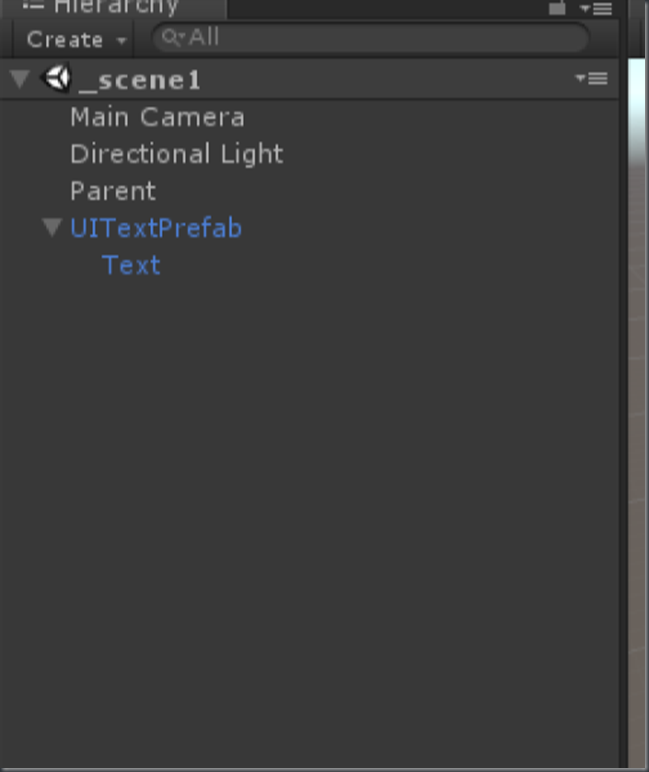 At this point, I was a little over-zealous in that I thought that the next step would be to try and write a library which would make it easy for Unity to make use of the code that I’d just had generated. // break Unity's threading model. 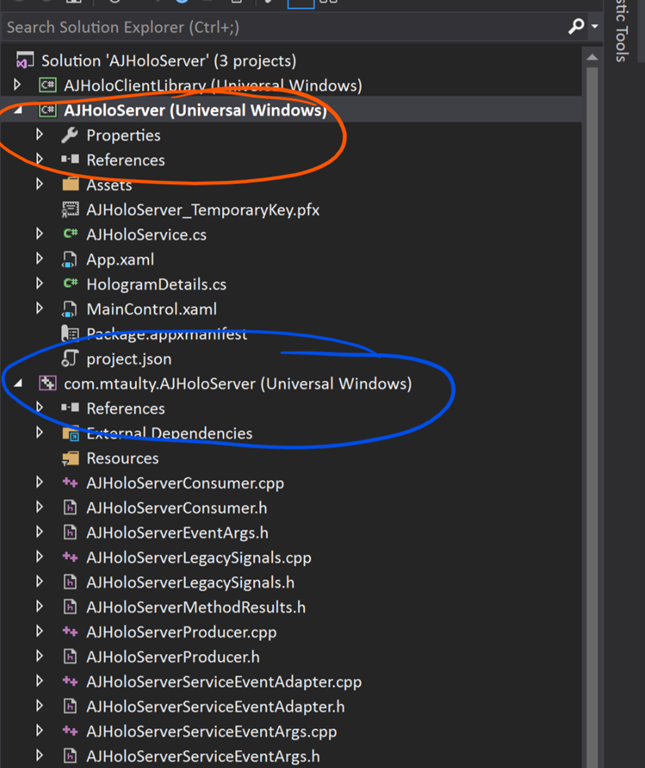 There’s nothing particularly exciting or new here, it’s just a static class which hides the underlying AllJoyn code from anything above it and it offers the IRemoteHologramsService over the network and fires a static event whenever some caller remotely invokes the one method on that interface. 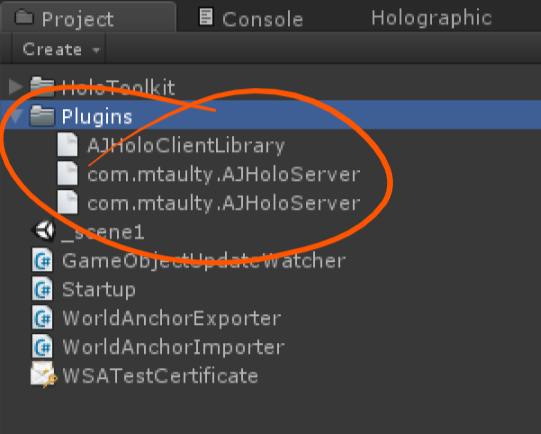 Clearly, this isn’t fully formed or entirely thought through but I wanted to just see if I could get something up and running and so I tried to debug this code having, first, made sure that my Unity app was asking for the AllJoyn security capability. 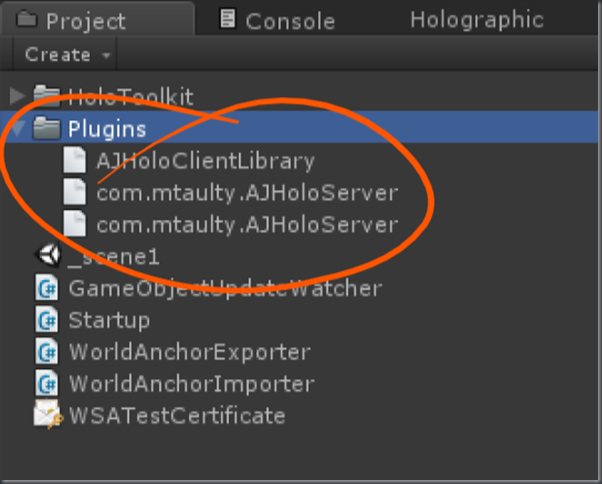 I used the IoT AllJoyn Explorer to try and see if my Unity app from the HoloLens was advertising itself correctly on the local network. That app still comes from the Windows Store and I’ve used it before and it’s always been pretty good for me. It took me a little while to remember that I need to think about loopback exemption when it comes to this app so that’s worth flagging here. 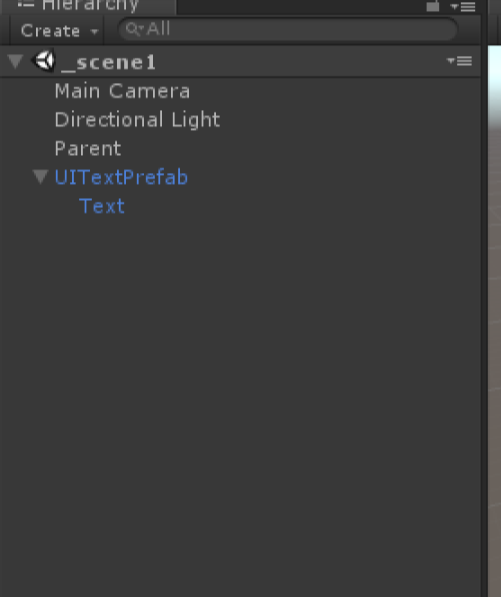 and so the code seemed to be ok and, at this point, I realised that I could have tested out the whole concept in 2D XAML and never dropped into Unity at all – there’s a lesson in there somewhere! 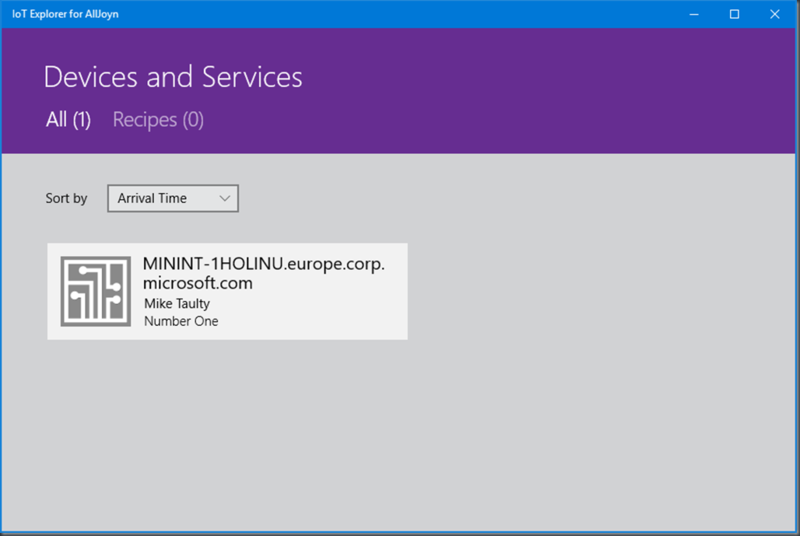 Having proved the point on my PC, I also ran the same code on my phone and saw a similar result – the service showed up on the network. 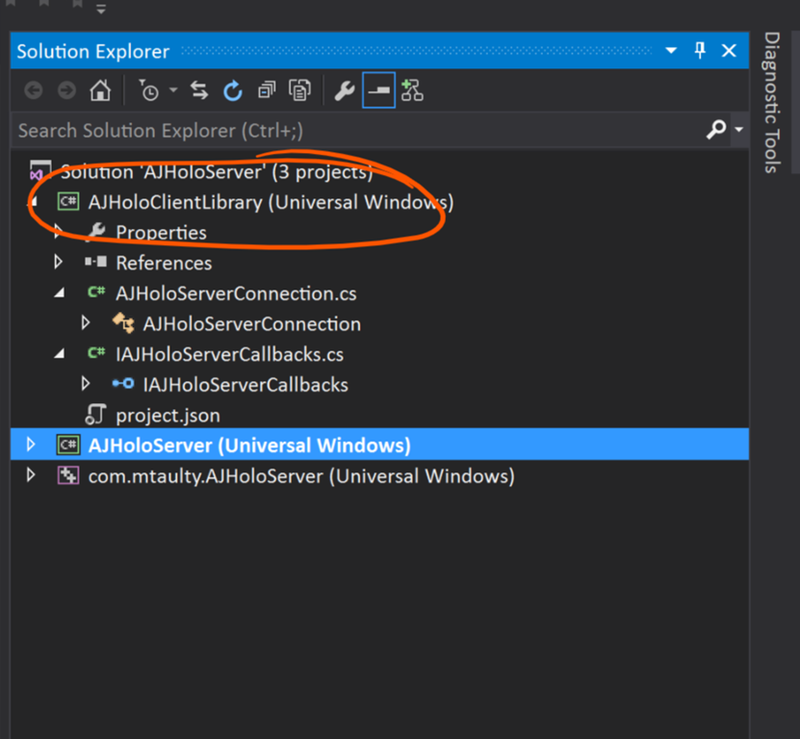 However, no matter how I went about it I couldn’t get HoloLens to advertise this AllJoyn service and so I have to think that perhaps that part of AllJoyn isn’t present on HoloLens today. That doesn’t surprise me too much and I’ve tried to confirm it and will update this post if I get a confirmation either way. If this is the case though, what might be done to achieve my original aim which was to use AllJoyn as the basis of a shared holographic experience across devices. 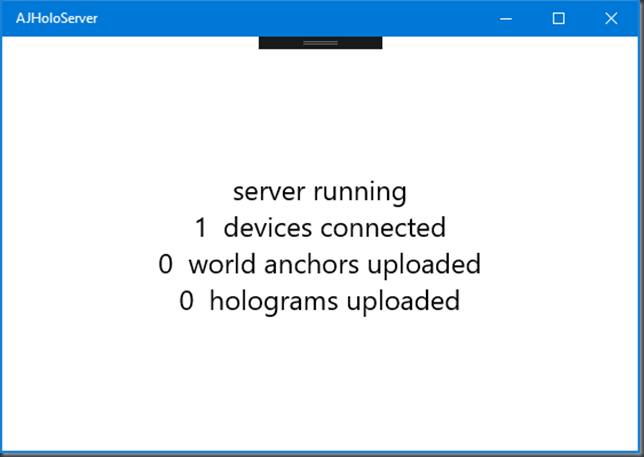 and so there’s a need for an extra player here (the PC) and also a need for using events or signals in AllJoyn to inform devices when something has happened on ‘the server’ that they need to know about such as a world anchor being created and uploaded or a new hologram being created. Devices join/leave the network and other devices might want to know how many devices they are in a shared experience with. World anchors get uploaded to the network and other devices might want to import them in order to add a common co-ordinate system. 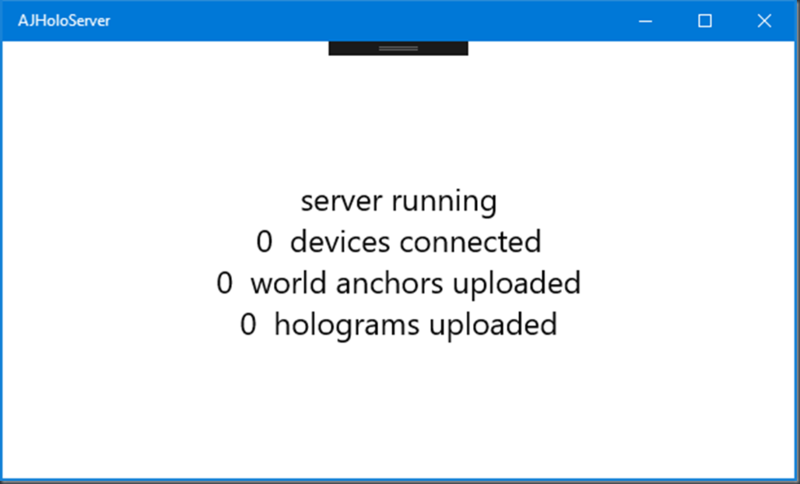 Holograms get added by a user (I’m assuming that they would be added as a child of a world anchor and so there would be an association there). Holograms get removed by a user. In addition, I’d also want to add the ability for the transforms (scale, rotate, translate) of a hologram to be changed but I left that to one side while trying to see if I could get these bits to work. and once again I should perhaps have realised that things weren’t going too well here. I used GUIDs to identify world anchors and holograms. 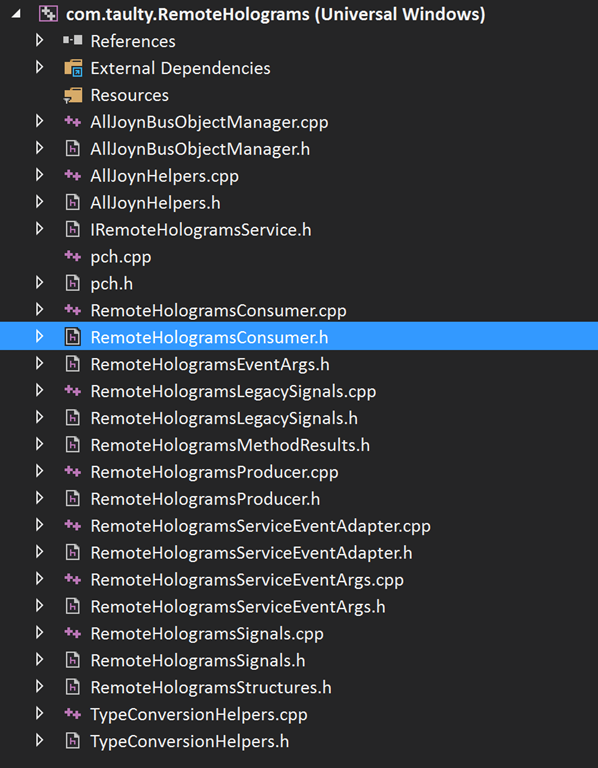 I’m assuming that types of holograms can be represented by simple strings – e.g. device 1 may create a hologram of an Xmas tree and I’m assuming that device 2 will get a string “Xmas tree” and know what to do with it. 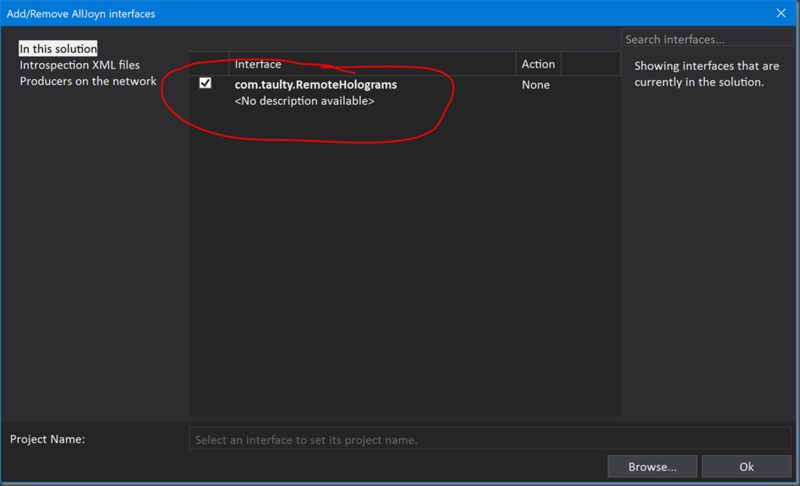 I wanted to have a single method which returns the [Id/Name/Type/Position] of a hologram but I found that this broke the code generation tool hence my methods GetHologramIdsAndNames and GetHologramTransforms – these should really be one method. My original method for AddWorldAnchor simply took a byte array but I later discovered that AllJoyn seems to have a maximum message size of 128K whereas world anchors can be megabytes and so I added a capability here to “chunk” the world anchor into pieces and that affected this method and also the GetWorldAnchor method. I should have stopped at this point as this limitation of 128K was flashing a warning light but I ignored it and pressed ahead. waiting for connections to come in. and made sure that my project was requesting the AllJoyn capability. At this point, I realised that I needed to have some capability where I could relatively easily import/export world anchors in Unity without getting into a lot of code with Update() loops and state machines. and disconnect when I shut it down and my voice command of “lock” seemed to go through the motions of creating a world anchor and it was quickly exported from the device and then it started to transfer over the network. It’s the classic sawtooth and I moved my same client code onto both a Phone and a PC to see if it showed the same behaviour there and, to some extent, it did although it wasn’t as pronounced. 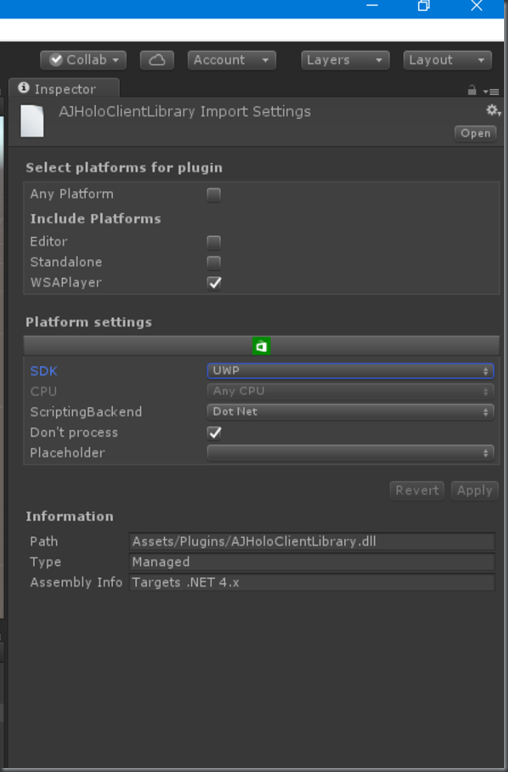 and in so far as I can tell this runs some relatively expensive conversion function on every element in the array which burns up a bunch of CPU cycles on the HoloLens prior to the transmission of the data over the network. This seemed to slow down the world anchor transfers dramatically – I would find that it might take minutes for a world anchor to transfer which, clearly, isn’t very practical. 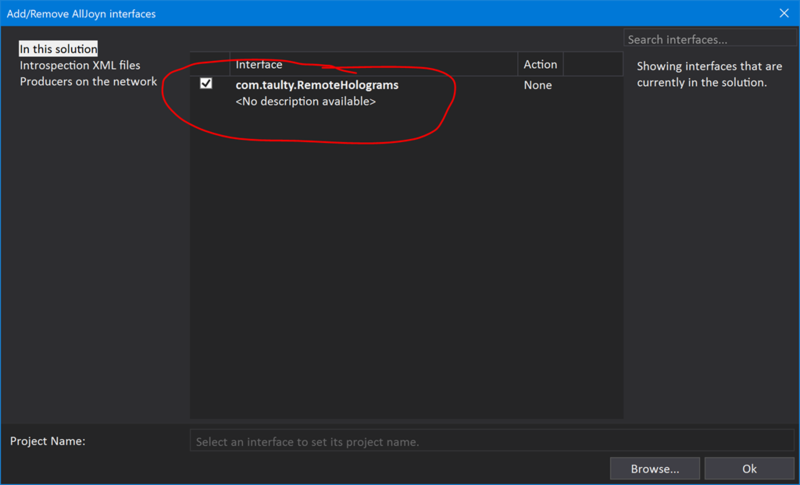 I wondered whether this was a bug in IoT Explorer or a bug in the runtime pieces and, through debugging the native code, I could use the debugger to cause the code to send 2 parameters rather than 3 and I could see that if I did this then the method call would cross the network and fail on the server side so it seemed that the IoT Explorer was right and my function expected 2 inward parameters and 2 outward parameters. 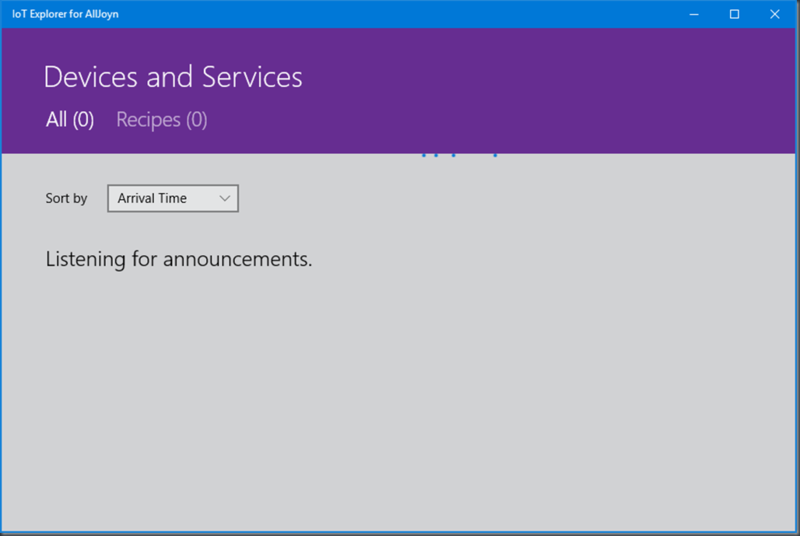 What wasn’t clear was…why and how to fix? I spent about an hour before I realised that this problem came down to a type in the XML where the word “direction” had been turned into “directon” and that proved to be causing my problem – there’s a lesson in there somewhere too as the code generation tool didn’t seem to tell me anything about it and just defaulted the parameter to be outgoing. With that simple typo fixed, I could get my code up and running properly for the first time. 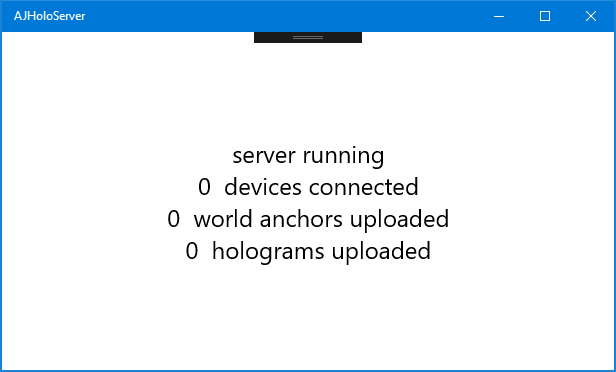 Run the app on my HoloLens. See the server display that the app has connected. 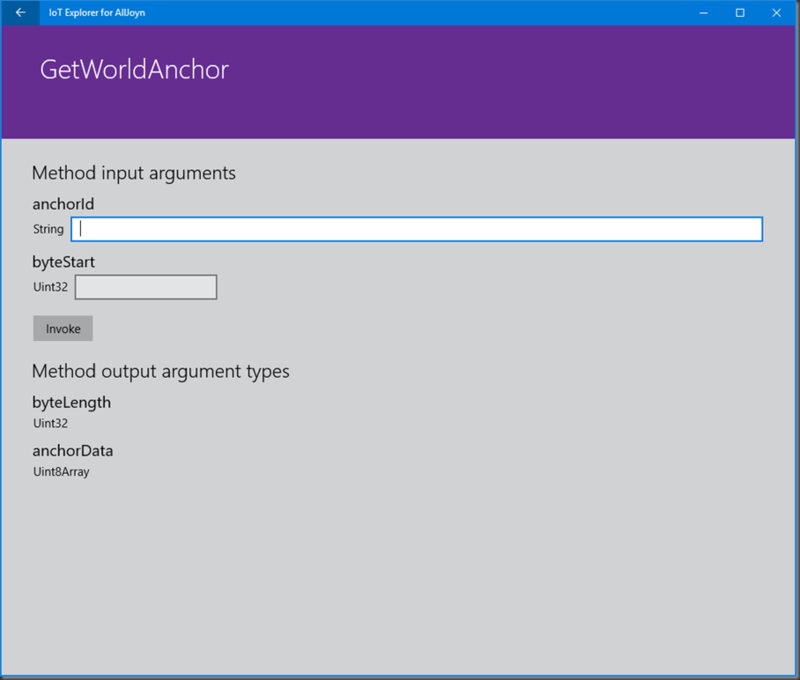 Use the voice command “lock” to create a world anchor, export it and upload it to the server taking a very long time. 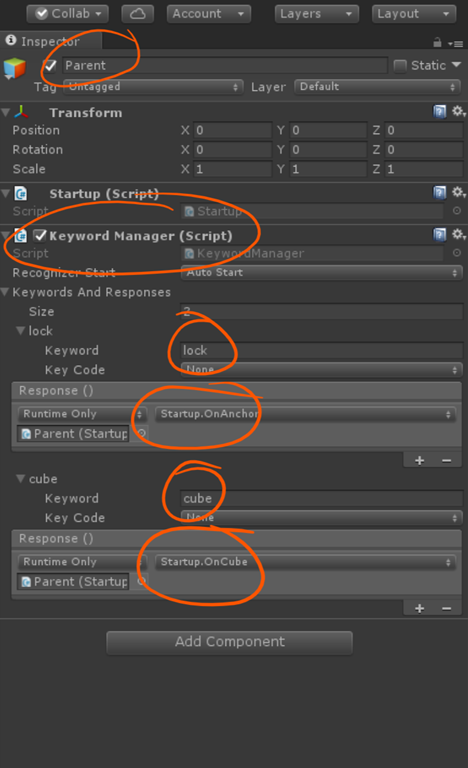 Use the voice command “cube” in a few places to create cubes. Shutdown the app and repeat 2, 3 above to see the device connect, download the anchor (taking a very long time), import it and recreate the cubes from step 5 where they were previously. 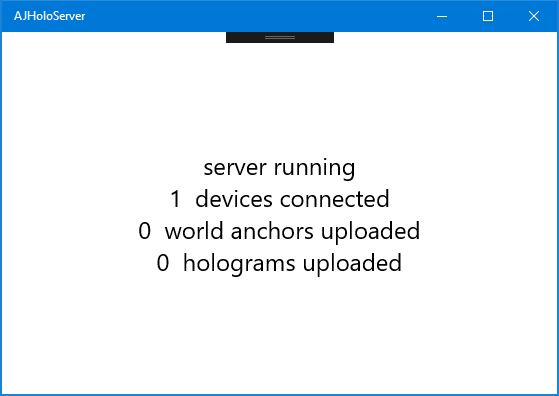 but, because of the bad performance on copying the world anchor buffers around, I don’t think this would be a great starting point for implementing a shared holographic server and I’d go back to using the regular pieces from the HoloToolkit rather than trying to take this forward. That said, I learned some things in playing with it and there’s probably some code in here that I’ll re-use in the future so it was worth while.